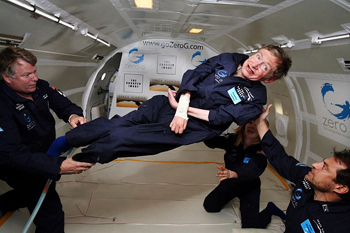 Stephen Hawking experiencing zero gravity. Image courtesy of NASA. This was how Stephen Hawking, the former Lucasian Professor of Mathematics, current Director of Research at the Centre for Theoretical Cosmology, best selling author and world famous science communicator, started his lectures. I first heard Hawking speak at his 60th Birthday Symposium on 11 January 2002, coincidentally my first day officially working for Plus. I was very sad to learn that Stephen Hawking died this morning at home in Cambridge at the age of 76. In his tribute to Hawking astronomer Sir Martin Rees said that despite Hawking's increasing frailty in his early 30s, when he couldn't even turn the pages of a book without help, he came up with his "best ever idea — encapsulated in an equation that he said he wanted on his memorial stone." and is known as the formula for the Bekenstein-Hawking entropy. Reading about its discovery, and the work of Hawking and Jacob Bekenstein, reminded me of the passion and excitement of science, the value of controversy and proving yourself wrong, and the importance of sharing ideas and building bridges between areas. I felt very sad when I heard the news of Hawking's death first thing this morning. Now, after a morning spent learning and about black hole entropy and Hawking radiation, I feel much more cheerful. 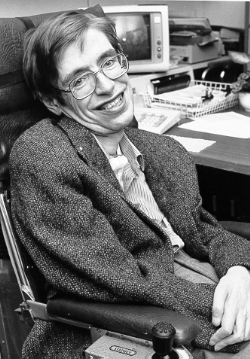 Hawking disagreed with Bekenstein's ideas when they met at a conference in 1972, believing there were instances of black holes that would disprove Bekenstein's conjecture. He apparently went back to Cambridge intent on proving Bekenstein wrong. It was generally accepted that nothing should be able to escape from a black hole, but when Hawking applied quantum theory to black holes he realised that something could escape. Quantum physics predicts that even in a vacuum pairs of quantum particles pop in and out of existence, and that these particles have an energy. Their presence is usually fleeting and they annihilate each other. But when this happens near the horizon of a black hole one of a pair of virtual particles can be captured by the black hole while one escapes. The escaping quantum particles create what is known as Hawking radiation. "...the obvious next step would be to combine general relativity, the theory of the very large, with quantum theory, the theory of the very small. I had no background in quantum theory... So as a warm-up exercise, I considered how particles and fields governed by quantum theory would behave near a black hole. ... To answer this, I studied how quantum fields would scatter off a black hole. I was expecting that part of an incident wave would be absorbed, and the remainder scattered. But to my great surprise, I found there seemed to be emission from the black hole. At first, I thought this must be a mistake in my calculation. But what persuaded me that it was real, was that the emission was exactly what was required to identify the area of the horizon with the entropy of a black hole. I would like this simple formula to be on my tombstone." In his tribute Rees says that the equation encapsulates the notion of Hawking radiation, the contribution Hawking was most proud of, that brought together previously unlinked areas of gravity (signified by Newton's constant and the area of the black hole ), quantum physics (the Planck constant ) and thermodynamics (Boltzmann's constant ). 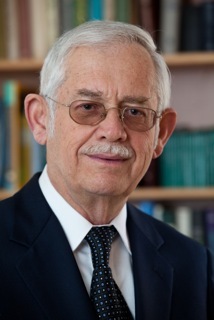 Rees goes on to say that Hawking radiation had very deep implications for mathematical physics and is still a focus of theoretical interest, a topic of debate and controversy more than 40 years after his discovery. The equation seems an apt inscription for Hawking's tombstone. Its discovery brought together disconnected fields, combining them into an elegant, surprising, and stimulating result. It came about through collaboration, communication and a healthy bit of competition between scientists. And most importantly, it is a human story of great triumph as Hawking himself said in his 70th birthday lecture: "The fact that we humans, who are ourselves mere collections of fundamental particles of nature, have been able to come this close to an understanding of the laws governing us and our Universe is a great triumph." The answer to Hawking's question at the start of his lectures is yes, we can hear you. And your passion and enthusiasm for communicating with everyone from academic peers to the general public, in lectures, books, cartoons and TV shows, has meant you have had an impact on a great many of us indeed. The current paper issue of New Scientist must have been published too late to report Hawking's death. But Rachel's words resonate with a report in the cover story about an experiment designed to "test one of the most famous predictions about black holes: that their edge or event horizon, glows with so-called Hawking radiation. Steinhauer blasted his fluid analogue with a laser to create something similar to an event horizon. Sure enough, he observed spontaneous sound fluctuations that mirror the ghostly Hawking radiation". (NS, 17 March 2018, "The Big Boil"). Could Rachel go on to explain in a bit more detail how this result corroborates Hawking's prediction?